Hello everyone and welcome back to my website! 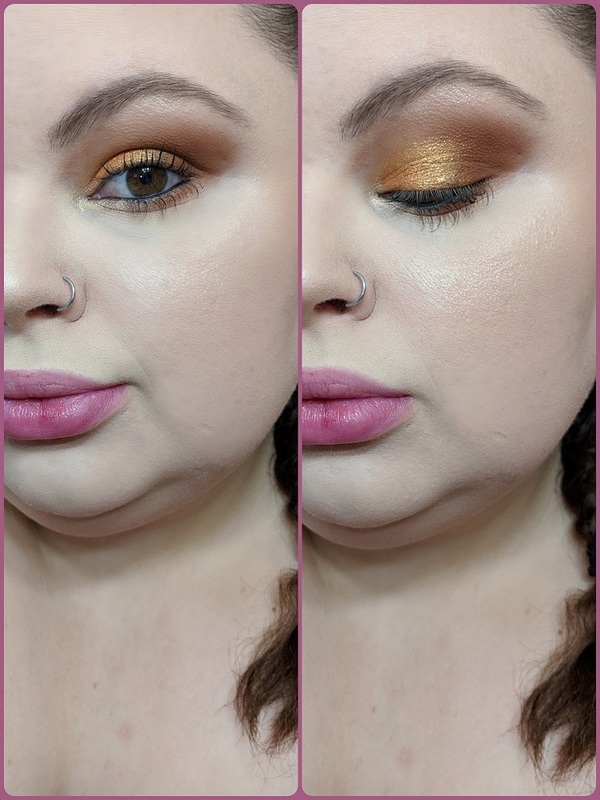 Today I played in the Jaclyn Hill Bling Boss palette from her Vault collection! The color story is right up my alley! Berries, Pinks, Purples and Mauve's are my literal comfort zone! I don't think I'm going to do much of a review of this collection, because everyone has reviewed the Jaclyn Hill Vault Collection. We all know the palettes are buttery, pigmented and beautiful. There's four palettes and they each have their own vibe, tone and theme! These palettes are going to push my boundaries. I hate stepping out of my comfort zone, but I'm going to be doing that very soon. Kind of funny story, I originally went in with the Dark Magic palette the evening I did this makeup look. I was going in with the greens, trying to do a fun St. Patrick's day look, But I got real spooked and was scared to go to iHop with green eyeshadow on. I mean, can anyone else relate? I love bright colors, But i'm scared of blues and greens... Alright, let's get into the Jaclyn Hill Bling Boss Tutorial. By the way, There are so many looks you can do with this palette, this is just my first time playing in the palette! 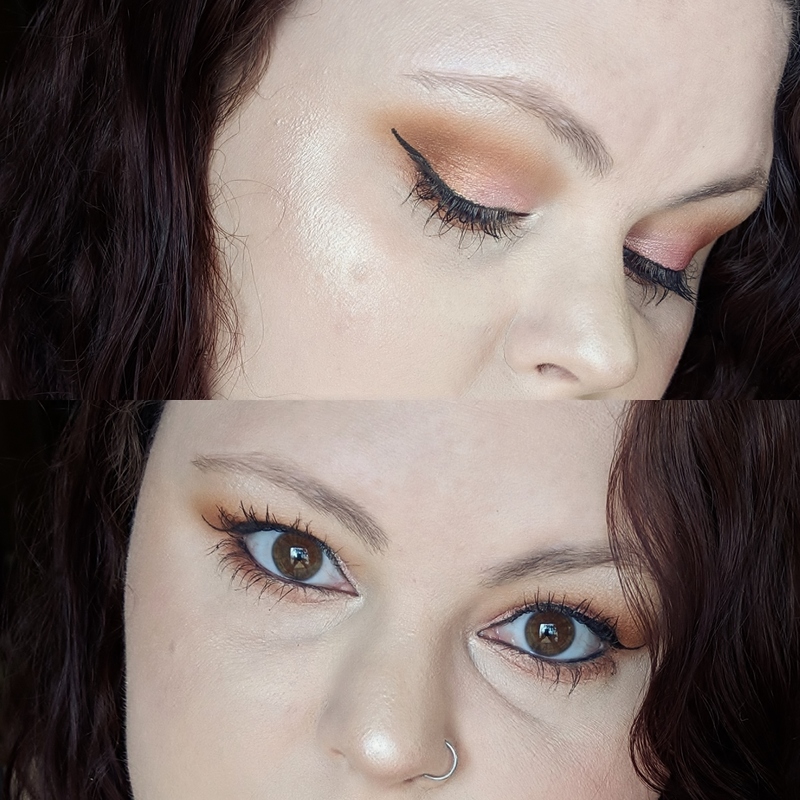 To start out this eye look, I primed my eyelids with the Wet n Wild Photofocus eyeshadow primer and set it with the Makeup Revolution Baking Powder in Translucent. On a nice and fluffy blending brush I picked up the shade Hush Hush and blew it out all over the lid, inner corner to outer corner and to the brow bone. I absolutely love a good mauve eyeshadow! On a more normal size blending brush I picked up Rockstar and ran it through the crease and outer third of the lid, trying to keep the lid a little less smoky, but I got carried away! I wanted to darken up the outer crease a little more so I picked up a tiny bit of Mystic and really focused it in the outer edge of the lid. I brought it about a third of the way on the bottom lash line. For the pop of beautiful shimmer on the lid, I picked up Bling Bling on a flat shader brush with a little spray to intensify the metallic-ness of the pink. On the brow bone and inner corner, I cheated a little and used the shade VIP from the Armed & Gorgeous palette. Such a beautiful frosty white, I imagine this color being insanely blinding if you use it with a setting spray! That is it for this Jaclyn Hill Bling Boss Palette tutorial, It's such a simple look that's also super pretty. I see this eyeshadow look being a soft romantic vibe. I just crave these kinds of looks, no matter the occasion, the day or the time, I know a look like this will have me feeling confident. Also I don't know if it's just me but pinks, mauve's and burgundy shades seem to make the green in my eyes pop a lot more. My eyes tend to look more brown, unless I wear certain eyeshadow colors! Thank you so much for checking out this tutorial. I'm sorry for always being a rambley mess! Hello everyone and welcome back to my website. Today I have the original Jaclyn Hill Palette! I know it's going to be two years old in June or July, But I finally just got it. It's not for a lack of wanting it or anything like that. I was never able to afford it till now. I also got her vault collection and I'll have tutorials for each of those as well. I'm so excited for all of the tutorials I'll have going up over the next month or so... I already I one of those done, I just have to write it... After I'm done with this post! The look I did with this palette, I know I know, It's kind of underwhelming! I was so panicked by all of the beautiful colors that I just didn't know what to do or where to begin! So I went with a warm toned kind of smokey eye with a super shimmery baby pink lid color. Lets get started boi's! Starting out this eye look, I primed my lids with the Wet n Wild Photofocus Eyeshadow Primer, and set it with the Makeup Revolution Baking Powder in Translucent. I decided to set my lid with this look because I wanted to see how pigmented the shadows were without a sticky base. Going into the Jaclyn Hill Palette I started off with the shade Pukey and brought it almost all the way into the inner corner on a bigger fluffy brush. I went in twice with it, bring it up a little bit higher for more of a blown out look. To deepen up the crease I tapped into Roxanne and kept it more in the outer third, blending it lower and keeping it focused in the outer corner. I ran Pukey and Roxanne lightly under the lash line, blowing Pukey out a little more, keeping Roxanne tighter to prevent it from looking too dark. On the lid I took a flat shader brush and some spray and picked up the shade Sissy, and put it all over two thirds of my lid, slightly blending it into the outer third. I also brought it on the lower lashline about a third of the way in. On the inner corner and brow bone I used the shade Beam. Thank you all so much for stopping by, please feel free to share this post! Just a little wrap up here, I love this palette. 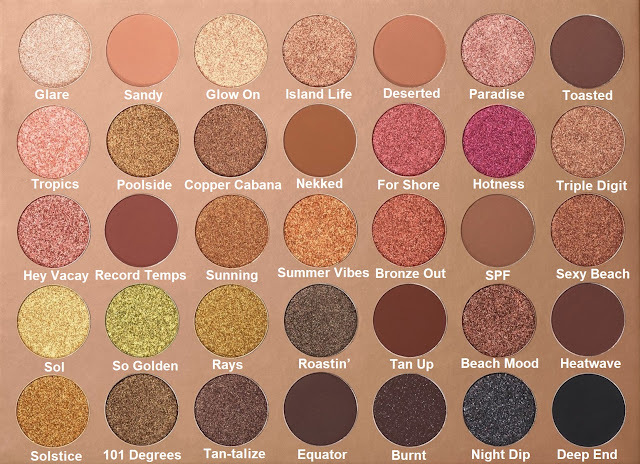 Oh my god, the mattes are soft, creamy, blendable and pigmented! The shimmers are so buttery and pigmented. I can't wait to play in the Jaclyn Hill palette again, But I also have other new palettes and I want to try all of them out more. 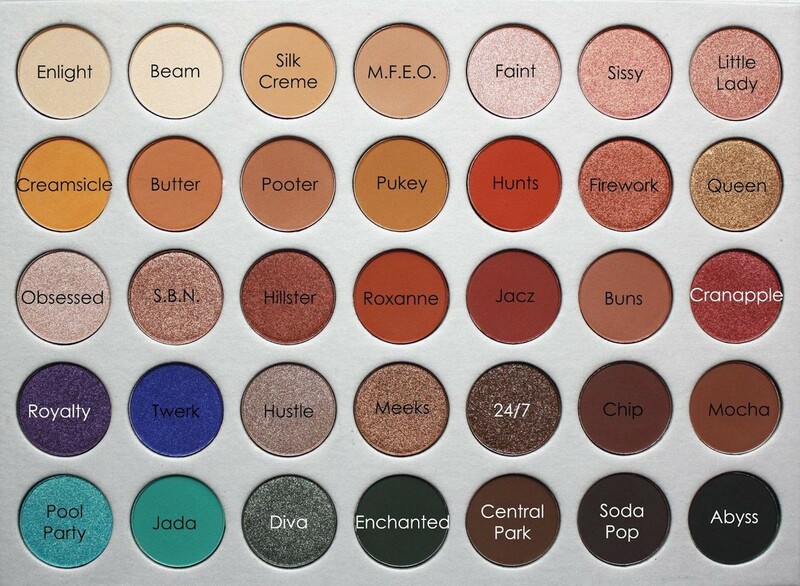 My next look with this palette is going to involve Royalty and Twerk! I don't know how I'm going to do it, but i'm using both of them together somehow! There are endless color combinations and looks that can be done with it. I'm so beyond happy the Jaclyn Hill palette wasn't sold for a limited time! Hello everyone and welcome back to my website! Today I have a tutorial and review using the new Morphe Bronze Goals 35G palette! I bought this palette in Ulta on a whim, I hadn’t heard anything about it, nor had I even heard Morphe dropped a new palette! I was so sucked in by all of the browns, bronze, gold’s, coppers and pops of burgundy shades. I just had to pick it up. This palette is pretty dark as well. There aren’t many lighter shades. So if you like to set your lid before applying eyeshadow, you’ll have to use either your setting powder, or a shade from another palette that matches your skin tone. That’s the one down side I’ve noticed off the bat. Let's get into the tutorial first, it's pretty simple! Starting out this tutorial, I primed my eye lids with my Wet n Wild Photofocus primer and set it with the Makeup Revolution Translucent Baking Powder. Going in with the Morphe Bronze Goals 35G Palette, on a bigger blending brush, I took the shade Sandy and brought it from the outer corner all the way through the crease, building up the warmth. On the same brush, I picked up Nekked and Equator and buffed them into more of the outer corner, bring it in the crease about a third of the way. Going into the copper shade, Summer Vibes, I picked it up on my finger and swiped it across the lid about two thirds of the way over. I felt it was looking kind of dark, so I picked up the shade Sol on a finger and patted it in the middle of the lid, making sure to blend the edges as I went. On the bottom lash line, I used a combination of Sandy & Nekked and softly blended them out, using Glare on the inner third, inner corner and brow bone. As you can see, The colors are beautiful! 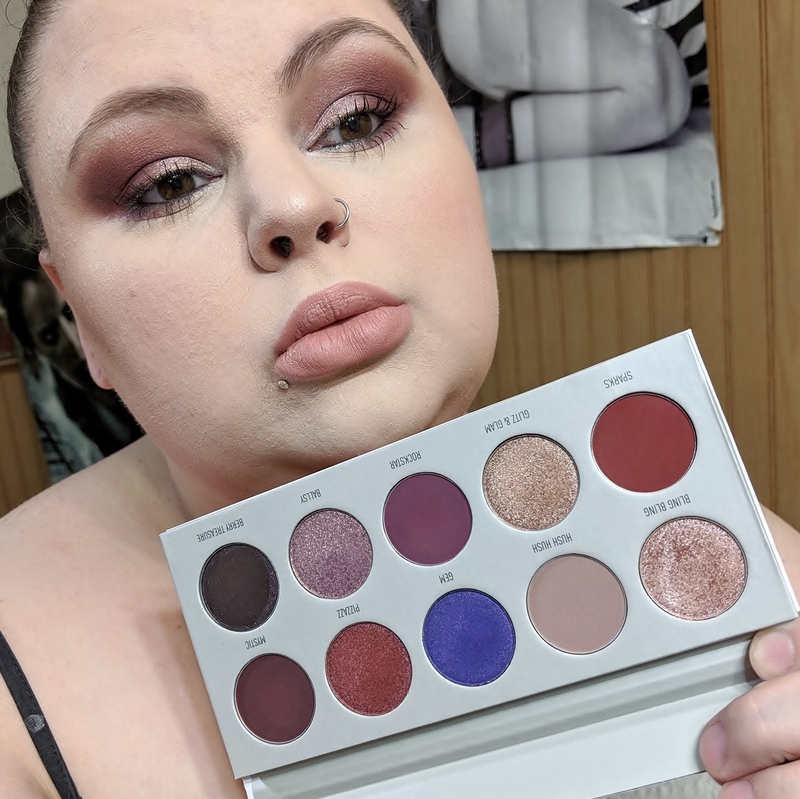 I do have a few things to say about the formulas on some of them, so lets get into the review of the palette. 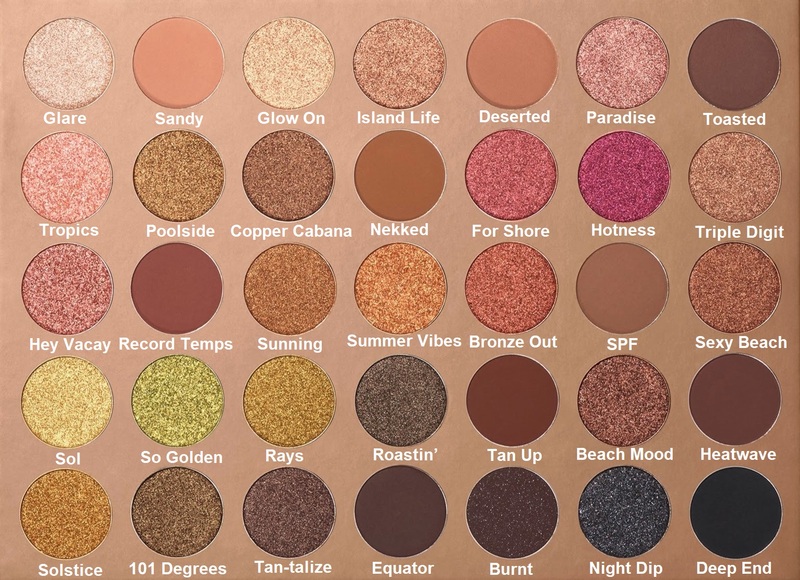 Let's talk about the formula of the matte shades in the Morphe Bronze Goals 35G Palette! I went through and swatched all of the shades and checked how they felt and the opacity of each of them. The mattes are pigmented, smooth and just beautiful browns. The black is so pigmented and beautiful, I was a little shocked at how good it was, to be honest. There's a really good mix of lighter and darker browns, as well as cool and warm tones. Now on to the shimmer shades in the Morphe Bronze Goals 35G Palette! I had some trouble getting pay off on a lot of them. It seems like their formulation is a little dry and definitely could of used more oils in them. They work beautiful if you use your finger, I did have some trouble getting pay off with a wet synthetic brush. Using a wet natural fiber brush on the other hand had really good pay off, again, when wet. They really don't pick up well on a dry brush. Overall my final thoughts on the Morphe Bronze Goals 35G Palette, despite the issues with the shimmer shades, I still highly recommend this palette. The mattes are creamy and blendable. The shimmers go on beautiful with a finger, as long as I can make them work without it being a fight, I honestly don't mind. Keep that into consideration. If that's something that you don't like to deal with, then maybe skip this on. 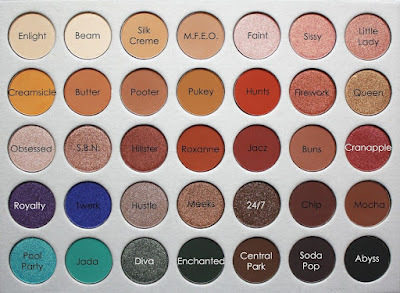 But the colors alone make the palette 100% worth it. Not to mention this palette is 35 shades for only $25.00! Here is the makeup look with three different lip colors. In these pictures, I'm demoing 3 sample lip colors I received from my daughter who works for the up and coming company VIC Cosmetics! The mattes are super pigmented, creamy and thin. They are not sticky or patchy and last a long time! The two glosses are a plumping kind of gloss and I love them! The pink one has a gold shimmer and the wine colored one has no shimmer and does stain which I Love!!! I'm so scared to wear bold colors on my lips but this is a color i'll be wearing a lot more often. 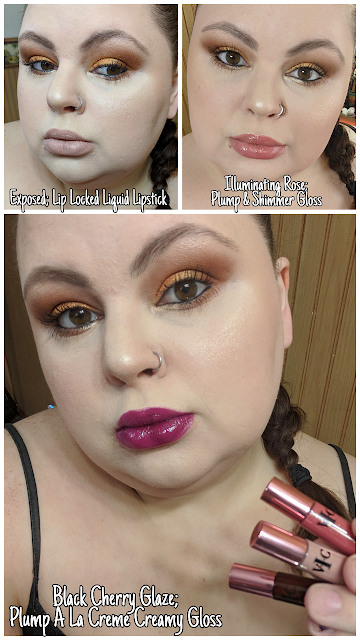 I'm going to have to purchase a full size plumping gloss asap! I'm going to leave my daughters link so you can order from her! They are a new company and coming out with some amazing stuff! Definitely check out their new mascara!